226423 for BOSCH Rexroth servo motor drive control systems. Replaces: Battery 226423 for BOSCH Rexroth PPC-R Controller. This 226423 Lithium PLC controller battery fits several BOSCH Rexroth and other PLC controllers. 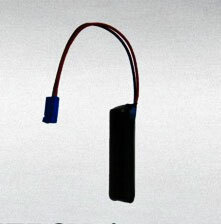 It is a DIRECT replacement for the 226423 battery. This BOSCH 226423 Bosch Rexroth battery is suitable for . Members of the Rexroth System200 PPC-R Controller and Rexroth SYNAX 200 PPC-R Controller family. This BOSCH 226423 Bosch Rexroth servo motor drive battery comes with a one year manufacturer's warranty.